No. 22 Notre Dame extended its undefeated start to the season by defeating Northwestern 5-1 at the Combe Tennis Center in Evanston, Illinois, on Sunday. In the singles competition, junior Alex Lebedev grabbed a 6-4, 6-2 victory on court No. 1, while freshman Tristan McCormick won 6-4, 7-6 on court No. 3. Over on court No. 6, junior Grayson Broadus defeated his opponent 6-4, 6-4, while sophomore Matt Gamble grabbed a 6-4, 7-5 victory on court No. 5. On court No. 4, Richard Ciamarra won the first set of his match by a score of 6-2 before dropping the second set by a score of 6-1. Ciamarra recovered, however, and took the deciding third set, 6-3. Irish junior Alex Lebedev prepares for an incoming serve during Notre Dame’s 6-1 win over Michigan State on Jan. 19 at Eck Tennis Pavilion. The only point the Irish (7-0) lost came in doubles play, as the Wildcats (3-5) took two of the three doubles matches. Sophomore Guillermo Cabrera also competed in singles play, but his match on court No. 2 went unfinished after the Irish had secured the victory. Irish head coach Ryan Sachire said he was pleased with his team’s performance Sunday. “It was a great win for us,” Sachire said. “Our guys played well, and more importantly, they competed well. Northwestern is a great team, and we were excited to do as well as we did against them. In terms of season record, I guess that is a great accomplishment. I think for us, it is more important just to stay focused on what we are doing each day and to play each match the best that we can play it, and I think our record and our ranking and that sort of stuff will all take care of itself. Sachire singled out Gamble’s and Lebedev’s performances, but he also said he thought everyone played well collectively. Despite the 7-0 record, Sachire expressed his desire to improve his team’s doubles play. “We still have a lot to work on for sure,” Sachire said. “We have to get better in doubles. That is a big thing. We’re not playing tremendous doubles right now, but that’s ok. We are still doing well enough to continue to be successful, but we definitely want to continue to improve the doubles area and get to the point where we’re one of the better teams in the country in doubles. That is our expectation and that’s our goal, and we’re not quite there yet now. 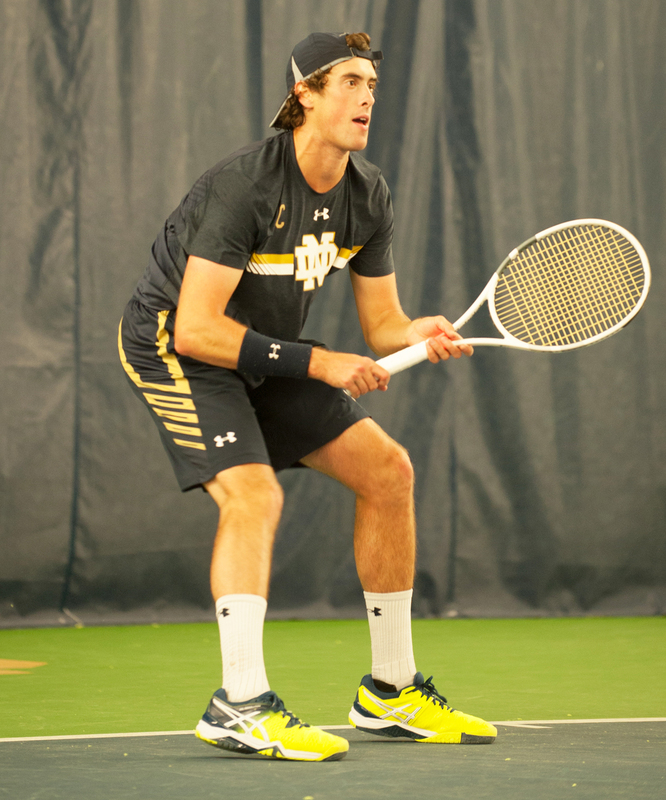 Notre Dame will be back in action this weekend when they participate in the ITA Division I national indoor championship, which is being hosted by Washington at Seattle Tennis Club in Seattle beginning Friday. The tournament features the top-16 teams in the country. Sachire said his team is looking forward to the challenges it will face during the tournament. He also said his team will continue to focus on doing the same things which have made it successful this early on in the season. “Just continue us doing the same things we’ve been doing, and that’s practice really hard and practice with the focus of improving and getting better and knowing when game day comes around, we’re competing for every point as hard as we can,” Sachire said. “It’s a pretty simple answer; but when you can do that, you can have amazing success, and our group has experienced that. So we feel really confident going into the national indoors. We know there are some great teams there, and we’re going to have to play very well to beat any of them.